Scamorama welcomes Basil Fawlty, hard-working Alaskan innkeeper! JAN EVERTSENSTRAAT 59 1058 BM - AMSTERDAM THE NETHERLANDS. We the entire staff of EU INTERNATIONAL LOTTO ONLINE AGENCY, wishes to congratulate you for being one of EU INTERNATIONAL LOTTO ONLINE WINNER.. This is an independent promotion and is unconnected to any publication. No purchase necessary. 1. Your winning prize has been placed in an escrow account by the lottery organization, the pending the completion of your claim process. All winners are referred to an attorney here in the Netherlands to have their winning prize notarize in the International Court of Justice in order to obtain their Award Winning Certificate from the N.G.C.B. 2. You must complete the claims process on or before the expiration date stated in the winning notification you received from the lottery organization, failure to do so will cause you to forfeit the prize. If you agree to the terms and conditions, reply to this mail stating that you agree to the terms and conditions and that you wish to proceed to claim your winning prize. 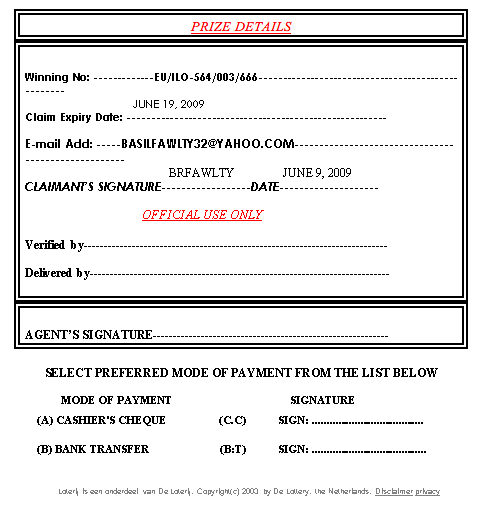 For notarization of your winning prize, you are to fill the attach Notarization application form and Payment scheme form, and send it to the lawyerÕs office for the notarization of your winning prize, to enable the lawyer acquire your Award Winning Certificate from N.G.C.B.. without the notarization of your winning prize the N.G.C.B. will not issue the Award Winning Certificate which makes you legally entitled to the winning prize, without this you have no legal claim on your winning prize. You are advice to send the filled form to the LawyerÕs contact below. (Director of winning claim department). [This is your basic Lotto Letter. I am writing for confirmation that the email i received yesterday was for me. JUSTICE JACOB WIT & ASSOCIATES. 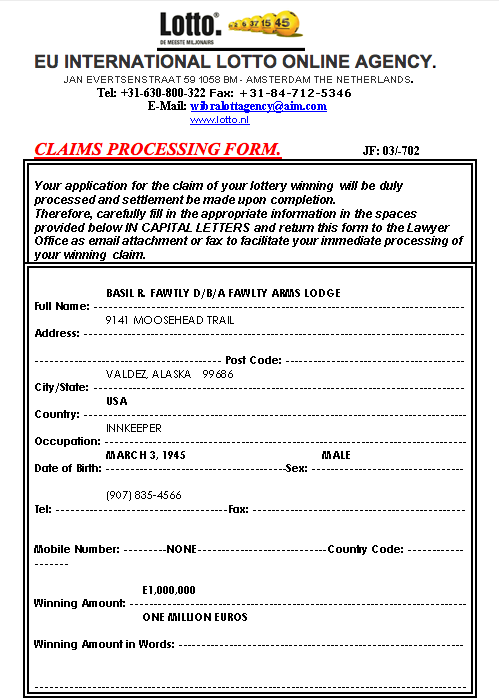 With regards to your mail, find in the attachment file an application notice that explains the requirements and procedure of your winning claim. We are therefore awaiting urgent response from you as soon as possible. I am pleased to be selected and have complied with your request to fill out the claim form. The lodge is in such need of repairs that the money will come in handy. Have already instructed my maintenance man Manuel to start buying supplies. With regards to your mail, as we have notified you before that we shall proceed to conclude the payment processes of your lottery prize of Û1,000,000.00 (One million Euros) to you in your stipulated mode of payment within three working days, this means that the Notarization fee of Û820 (Eight Hundred and Twenty euros) due to the Law here in the Netherlands have to be paid to the Netherlands High Court of Justice fo r registration three working days before the date of your arriver to enable us notarize your winning prize at the Netherlands High Court of Justice and obtain your Award Winning Certificate from the Netherlands Gaming Control Board on the 18th of June, 2009. You are advice to send the Netherlands High Court of Justice Notarization fee of Û820 (Six Hundred and Twenty euros) through western union money transfer in favor of my secretaryÕs name: Mr. Etten Kazi. Den Haag the Netherlands. Note: We are not allowed by the rules to deduct or add to winnerÕs sum. It is mandatory that the complete winning sum should be transfer to winners. I have decided that i really need a few days away from the Lodge. So i have decided to come to Amsterdam to claim my prize. My wife Sybil will stay on at the lodge to manage things in my absence. Of course, she will have the help of my handi-man Manuel. He's from Mexico and sometimes his english is not so good. Anyhow, my do i give you my flight schedule or do i send it to someone else. Well here it is anyway. I leave Tuesday June 16th for New York. My flight to Amsterdam leaves on Wednesday from JFK Flight #8870 departing 5:40 pm arriving Amsterdam 7:15am. It would be great if the protocol officer could pick me up and we should be able to make my 10:00am appointment in plenty of time. Perhaps after the meeting we can sample some Dutch beer. I will get a taxi to my hotel. By the way my attorney Mr. John Kleese will accompany me on the trip. After my attorney Mr. Cleese and i read the regulations for claiming my prize,we have concluded that according to the Rules, we are able to bring the fee with us on our trip. The fee can be paid at the time of notarization. I will bring a certified bank checque payable to the Court of Justice, Netherlands. Since i am rather near-sighted, my attorney who will accompany me will be looking at the airport for your Protocol Officer. I suggest he hold up a sign reading Mr. Basil Fawlty/Mr. John Kleese. That way we will know who the Protocol Officer is. Many Thanks for your support in this endeavor. With regards to your mail, Netherlands High Court of Justice do not accept cash, you are required to pay the International Court of Justice Notarization fee of 820 Euro, through Western Union Money Transfer in favor of Mr.. Tom Games, (The Secretary) Amsterdam the Netherlands, and send us a copy of the Western Union Money Transfer payment slip by mail/fax for registraction. I am looking forward to our meeting on Thursday. There is a great beer pub that i went to a couple of years ago in Amsterdam that i think you will like, It is called IN De Wildeman, its on Kolksgteeg. After we conclude our business i suggest that we celebrate. The beer is on me. Oh, and some good news. A woman named Sofia Van Der Bern from the Court of Justice said that they would accept my Certified bank draft as long as it was in EUROS. So we are good there. My attorney Mr. Clees and I are looking forward to meeting you. Dont forget to remind the person who is picking us up to hold a sign that read Mr. Fawlty/Mr. Kleese so we will know who he is.